SimpleSite offers the ability to make a website fast and with no technical knowledge needed, but in exchange, you lose a lot of the functionality and features you would get with other site builders. If you want to build a website, but lack technical expertise, then you probably are looking for a web editor that’s basic and easy to use. While that sounds like a great thing, be careful of what you wish for. SimpleSite, living up to its name, has one of the simplest web editors on the market and offers a true point-and-click style interface that will allow you to build a site with no technical knowledge required. They also have great features like automatic mobile-optimization that will enable mobile users to access your site with ease. But with its simplicity comes trade-offs. While you can quickly build a website with SimpleSite, it is going to be lacking in features commonly found in other website builders. Also, your site is going to look like you took a DeLorean back to 1999 and registered an account with GeoCities. Depending on your goals, SimpleSite’s ease-of-design and available features may be worth the trade-offs. Most website builders have a library of templates that you can use to create your website. With templates, you can quickly build your site without having to worry about coding various elements. If you don’t like one layout or it gets stale, you can quickly change it. Sadly, SimpleSite doesn’t give you this option. Instead, they use a variety of themes. Themes are just basic layouts with elements that can be configured. However, these themes offer little variety, and site layouts are almost identical across the board. On the plus side, SimpleSite themes are straightforward. All the theme options can be modified via a series of point-and-click menus with no web coding necessary. Free account users have about 15 different themes to choose from. Unfortunately, the only real difference in these themes is the color scheme. Otherwise, the layout is identical. Once you’ve set up your account, you can begin customizing your theme. For free users, you can change website colors, background, fonts, and the general layout. While you can modify design options, your choices will be limited. There are only a handful of images you can select for your background, but you can upload your own. Website colors can be changed, but only by choosing a pre-defined color scheme and there doesn’t appear to be an option for customized colors. Also, your website is limited to just five general layouts for basic customers. You have to upgrade to pro if you want more options. If you’re planning on posting videos or other forms of multimedia, a free plan won’t work for you. Multimedia functions are only available for paid subscribers. While your theme options may be limited, one advantage of these simple designs is that they are remarkably mobile-friendly. All themes are mobile-optimized with a responsive design and work well on all mobile devices and screen sizes. Overall, I was highly disappointed in the customization options at SimpleSite. Using themes over templates seems like a move straight out of the 1990s and is very restrictive. Also, there’s very little variety in the layouts, with the majority of websites hosted on SimpleSite looking the same. SimpleSite’s goal is to make the process of creating your website simple. They don’t have all the bells and whistles that you see on some web builders such as customizable templates or WordPress compatibility. However, there are a few things that help them stand out from other basic web builders. 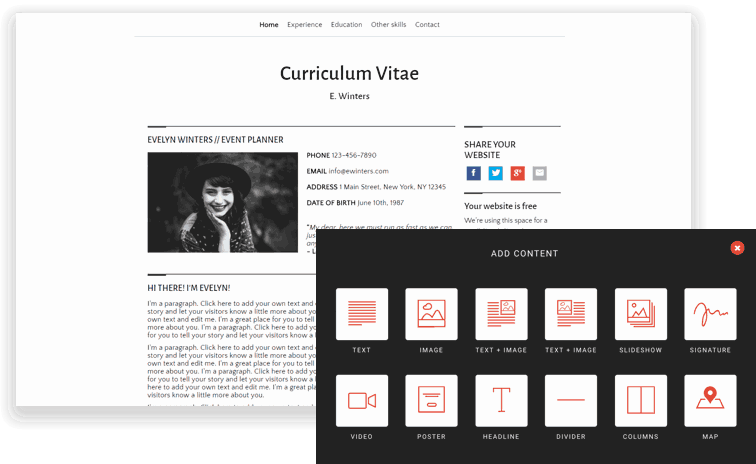 Simple Site Editor – As the name implies, SimpleSite makes it simple to create your website. Their web editor offers simple point-and-click design elements. Choose what you want to change and select from a list of available options. This editor is as remarkably basic. If you have no clue where to start in building a site, this is going to be a great option. The most complicated design elements are as simple as copy and paste. My father is not tech savvy at all, and I feel that he could make a functional website using SimpleSite’s editor. Of course, the drawback to this is that your website is going to look like it was designed by a basic web design tool. Your customization options are going to be limited, and your site will look dated. Mobile-optimization is no longer a luxury, but a necessity if you want to drive traffic to your site. With over 4 billion mobile users worldwide, it is crucial that your website works on all mobile platforms. The only way to do this is with a responsive mobile-optimized design. What’s great about SimpleSite is that all their websites are mobile-optimized. Back in the day, you had to set up a separate site or add extra code to allow mobile devices to render your website correctly. SimpleSite does all of this automatically. If you want your site to rank on search engines such as Google or Bing, then you need to have your own personalized domain name. Most website builders or hosting companies charge a fee to register your domain name with fees ranging from $5 to as much as $35. SimpleSite allows you to create your own personalized domain name as part of your paid subscription. This is a real time saver as you don’t have to go through the process of registering the domain name and then transferring it. The cost savings is also great for those looking to save money when building their site. If you have products to sell, SimpleSite gives you multiple options for creating your web store. With the free version, you can add up to five products to sell on your site. This is perfect for someone selling a few brand-related products. Those wanting to operate a fully functioning web store can upgrade to the e-commerce plan and get tools necessary to sell their full line of products. Granted, these web stores aren’t going to be on par with other tools such as Shopify or WooCommerce because of the lack of customization options compared to those other platforms. With that said, the web store feature will be easier to use than other e-commerce website platforms. If you don’t mind trading some sizzle for simplicity, this may be a great option to open your web store. One thing that I do appreciate about SimpleSite is the simplicity of the website builder. The builder offers simple point-and-click design options that require no technical skills. Want to add a picture? Just click on the option to add images and then select whether to upload it from your computer or paste a link to the photo’s location on the web. All design options are that simple to use. It won’t take long to figure out how to use this web builder, and there are basic tutorials available if you happen to get stuck. For those with content ready to add, you can realistically build a fully functional website in less than an hour. For those with no web design knowledge, this builder will help you get your site online. Unfortunately, most seasoned website builders will find it a bit too simplistic. There are few, if any, skills you’ll learn building this site that will transfer to other web builders. One area where SimpleSite is lacking is their customer support. Answers to basic questions can be found in their FAQ section, but the questions are very elementary, such as “can I resize images?” Anything above the most fundamental issues needs to be handled by customer support. Presently, your only option to contact customer support is via email. This is very disappointing. What happens if a database gets corrupted or a server goes down? You have to send an email and hope they respond quickly. Their site states that it can take up to two days to get a response. At a minimum, website builders and hosting services should offer live chat support. This way you can get serious issues addressed quickly. The best services also provide telephone support. Even if live chat and phone support were offered limited hours, it would be an improvement over SimpleSite’s present setup. SimpleSite offers three subscription levels. The first level is their Basic service. Basic is free to use but also has the fewest features. You have limited design options, and your site is limited to 15 pages. Also, SimpleSite ads are displayed on each page. To get rid of ads, you have to upgrade to a paid premium plan. Your first option is their Pro plan with is excellent for both personal and business websites. You get a free domain name, all available design options, and five email addresses. There’s no limit on the number of pages, images, or the amount of video content you can host. If you plan to host a web store or other form of e-commerce business, you need to upgrade to the E-commerce plan. You get all of the same features as Pro, but you also get unlimited online store products. Premium plans offer either a monthly or an annual term. How much are you willing to trade for the sake of simplicity? That’s the question you need to ask when choosing whether to build a site with SimpleSite. It offers the ability to make a website fast and with no technical knowledge needed, but in exchange, you lose some of the functionality and features you would get with other site builders. Those who will benefit most from SimpleSite are those looking to design their website without hiring a web designer or spending weeks learning how to build their site. The simple design does save time, effort, and results in a fully functional product. If you’re considering SimpleSite, don’t overlook the drawbacks. Your options for customization are limited compared to other web builders. You don’t have a library of templates available, meaning your site is going to look very similar to others hosted on this platform. As such, you will need to focus more on drafting quality content to make your site stand out from others in your niche. For those with some technical skills or those needing more advanced features, I recommend looking elsewhere as SimpleSite is going to be too basic for your needs. If you’re someone just looking to get a web presence and you’re willing to sacrifice a few features, then SimpleSite may be a perfect fit. Like SimpleSite Review? Click here to build your website. Wondering how SimpleSite stacks up against other Website Builders? Enter any other Website Builder and we will give you a side-by-side comparison.